Wired up to Wellbeing was a pilot project run through Birmingham’s Yardley libraries. The project aimed to promote the independence and well-being of the over 50s, helping them make use of the Internet in a welcoming, safe and supportive environment. 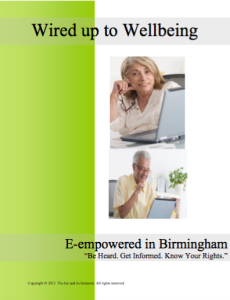 Get ‘E-empowered’ and access Birmingham City Council and Government online services. ‘Keep in touch with email’, send digital greetings and photographs. Follow the ‘E-plan’ for online health and wellbeing advice and guidance. ‘E-friendship’ through safe use of the internet. Discover your ‘E-family tree’ and get back to your e-roots. Join the ‘E-conomy’ to manage your finances and shop online.